Create easy-to-understand and entertaining sweepstakes using Antavo’s Contest lite module, where customers can spend their points on lottery style tickets to enter to win prizes. Customers can increase their chances of winning by sharing the contest with their friends on social networks, which increases the virality of your contest. Running a contest is a cost-effective way to reduce the number of unspent points in your loyalty program, as customers will redeem their points for the chance to win a prize – not directly for a prize itself. Customers can enter contests as many times as they want to increase their chances to win, which maximizes the point-burning effect. Sharing the contest on a social network guarantees an additional free entry for the customer. 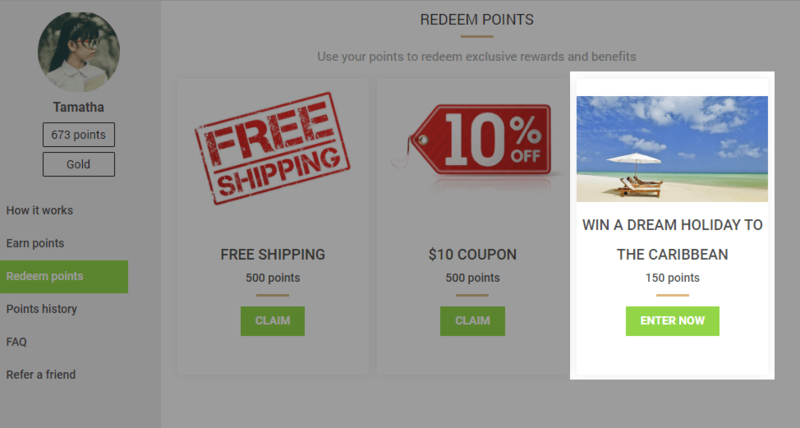 Members can learn about contests from a loyalty card on the Redeem points page, which will redirect them to a standalone contest page inside the Loyalty Hub where they can enter the contest. You can find the configuration page of the Contest lite module by clicking on the ‘Modules’ link in the top menu bar, then selecting ‘Gamification modules’ from the list on the left-hand side. The page will open to a list of your contests that have already been set up. To create a new contest, click the ‘Add new contest’ button on the module’s configuration page. You can identify the contest by this title later on in the platform. This title will also be visible to customers in the Loyalty Hub. This image will appear on the loyalty card on the Redeem points page, as well as on the standalone contest page and in pop-ups. This description will appear in the Loyalty Hub. The Terms & Conditions should contain all the legal details about the rules for participation. These will appear on the standalone contest page. Write a restriction message that tells customer why there are not able to enter the contest. This is a required field if you have set segments previously. The price you set here applies to one entry. Winners will be selected from the pool of all entrants, randomly, without any prioritization. Winners will be selected from customers with the most entries, randomly. Customers with the highest number of entries will win. After saving the reward, the contest remains inactive until you click on the “Set active” button on the upper right-hand side of the page. Contests can be edited until the contest is closed. Once a contest ends, you can select winners using the winner selection method you chose when creating the contest. You’ll see a list of customers who participated in the contest, along with the previously selected set of winners (if applicable). You can draw winners in a contest an unlimited number of times using the ‘Draw again’ button. To ensure that no one overwrites the results of the winner selection, you should close every contest. When a contest is added, a new card will appear on the Redeem points page with the contest’s title and image—both can be added on the contest setup page. The texts that appear on the CTA button and on the label of the entry-cost are not customizable on the platform. 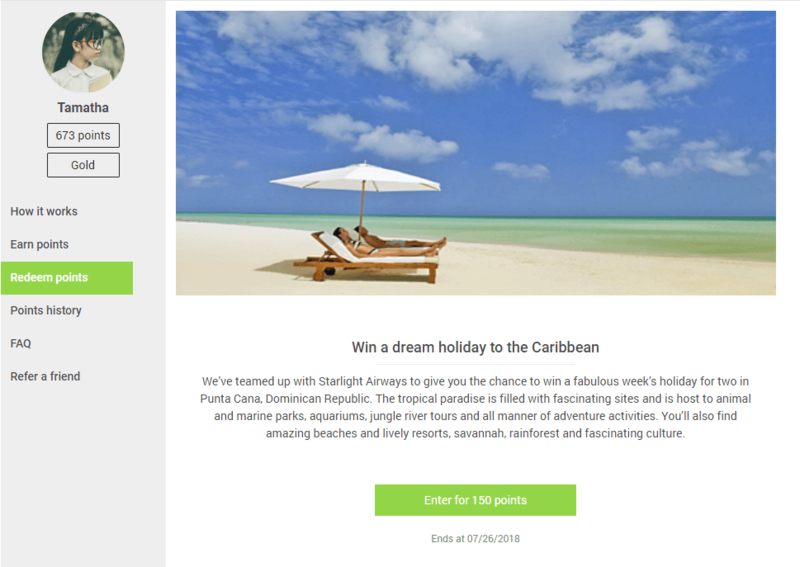 Once customers click the card, they will be taken to the contest’s dedicated landing page, where they can see how many points they have, how many points are required to enter, and how many entries they currently have (if any). Customers can also find a share button that they can use to share the contest and increase their chances of winning by earning an additional entry. The contest popup is automatically enabled. If one of your customers shares the contest on social networks, visitors that follow the customer’s unique link will see a pop-up, from which they can register in your store and participate in the contest. Please contact your Onboarding manager to customize the look & feel of the card, the page and the popup. Be sure to announce winners on your website and contact the winners to let them know how they can receive their reward. Include the terms and conditions of your contest in the contest description (i.e. number of winners, winner selection method). We recommend uploading a picture of the prize when you create a new contest. By offering prizes of a lower value and selecting more winners, customers will feel more likely to win, which will make them want to try their luck. On the other hand, an exclusive reward can attract more customers to join your loyalty program and your contest. To reach as many people as possible with your contest, run a targeted newsletter and ad campaign highlighting the reward.